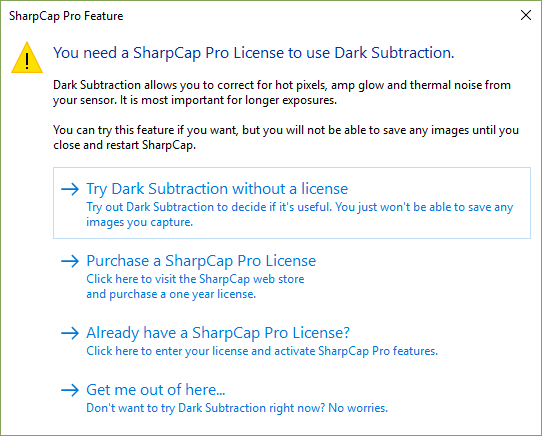 A number of the more advanced features of SharpCap now require the purchase of a SharpCap Pro license. SharpCap Pro licenses are reasonably priced, can be purchased for 1 or 5 years or a lifetime license and are available from http://store.astrosharp.co.uk/ . You do not need to install a separate version of SharpCap if you wish to use SharpCap Pro features – the SharpCap Pro features are already in the normal installed version of SharpCap – they become available to you when you enter a SharpCap Pro license key. You can try out most SharpCap Pro features before purchasing a license. If you decide to try out one or more SharpCap Pro features without entering a license then SharpCap enters an evaluation mode where you cannot save any images until you close and then re-start the application. Evaluation mode allows you to see the effects of SharpCap Pro features on screen but not save the resulting images. which allows you to choose whether to use the feature in evaluation mode, purchase a new license or enter an already purchased one or you can choose not to use the feature after all. The table below shows the list of features that require a SharpCap Pro license. These features are also highlighted with the text ‘[PRO]’ where they are mentioned in the remainder of this user guide. You can measure your polar alignment error without needing a license. 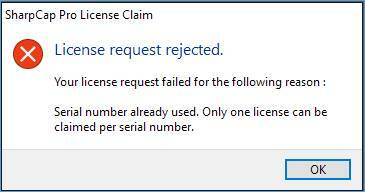 Guidance on adjusting to correct any error requires a license. Seeing Triggered capture and Seeing Filtered capture can only be activated with a license. SharpCap Pro licenses can be bought by visiting https://store.astrosharp.co.uk . Payment is accepted via PayPal. If you do not have a PayPal account then you can either choose to create one or choose to buy without creating an account using your credit or debit card (just follow the PayPal link anyway and you should see the option to buy using a credit or debit card). Once you have paid, your license will be sent to the email address that you used on the PayPal site, so please make sure that it is correct. Sometimes license emails can get caught in your ‘Junk’ email folder so be sure to check if the license email does not arrive promptly. You will also see your new license in your web browser – just let your browser return automatically to the AstroSharp website after completing your PayPal payment. To install your new SharpCap Pro license, run SharpCap, go to the 'Help' menu and select 'SharpCap Pro License'. Copy the license text from your web browser or email and paste it into the license box. Be careful to include all of the license text. Once entered, your license should look like the example shown below (without the blurring!). Every line of text should start with a field name (like LicenseId or Expiry), followed by an equals sign ('=') followed by the field value. Don't include any other text and make sure you include all the lines shown. If your license is entered correctly then you will see the license status change to ‘Valid’ below the license entry box. SharpCap Pro licenses are sold on a subscription basis – that means that if you buy a one-year license, it will allow you to use SharpCap Pro features for one year from the date of purchase. If your license has expired then you will no longer be able to access SharpCap Pro features (but you will be able to continue using the many non-Pro features in SharpCap). Subscription based licensing allows the annual cost to be kept very low. 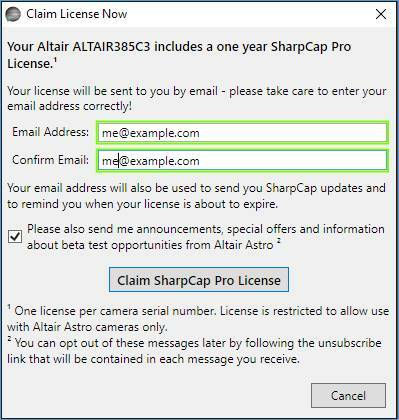 You should receive two reminder emails in the weeks before your SharpCap Pro license expires to let you know that will soon be time to renew your license. You will also see notifications inside SharpCap itself warning you when your license will expire soon. 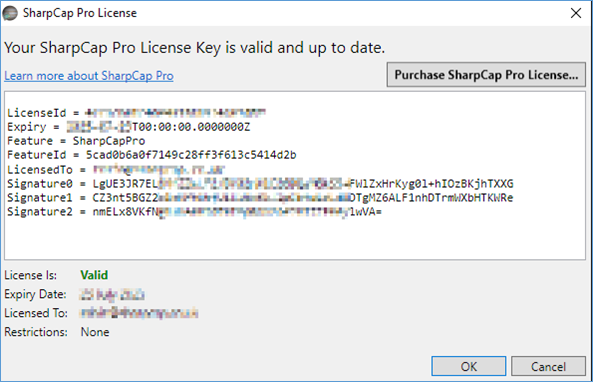 If you choose to renew your SharpCap Pro license then you will receive a new license key. You will need to replace the existing license key in SharpCap with the new key, following the steps in Installing your SharpCap Pro License. The new key will be valid immediately, so there is no need to wait until your old key expires before making the change. Some cameras are sold with an offer of a 1-year SharpCap Pro license included with the camera. If you have purchased one of these cameras then follow the steps below to claim the license. · Ensure you are connected to the internet – the license claim procedure requires a working internet connection. · Run SharpCap. If you do not have a SharpCap Pro license already, then a notification should appear at the top of the screen soon after SharpCap starts. · In the license claim window, enter your email address. Take care to enter your email address correctly, as you will receive a copy of your license by email. You can choose to share your email address with the camera manufacturer to receive updates and special offers if you want (this is entirely optional – if you choose not to share your email address with the manufacturer then your email address will only be used to send you your licence key and remind you when it is about to expire). · Press the Claim SharpCap Pro License button – after a few moments your claim will be processed and you should see a message confirming the license claim has been successful. Your license email should usually arrive within a few minutes. Note: Licenses included with purchases cameras are only valid for use with the specific brand of camera they were claimed against.